Sporadic Sentinel: Oregon Football Preview: The Alamo Bowl. Remember the Aliotti! Oregon Football Preview: The Alamo Bowl. Remember the Aliotti! 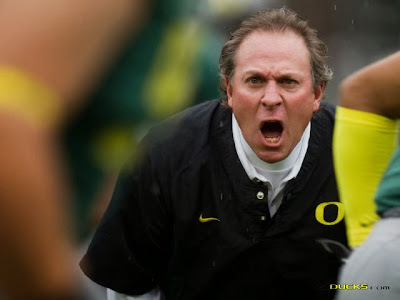 Ah, Nick Aliotti, Oregon football will be boring without you. Nick, Oregon's defensive coordinator, is retiring after the Alamo Bowl on Monday (3:45 pm PT, ESPN) and 38 years in coaching. In the spring, as the Ducks were adjusting to life without Chip Kelly and the feeling of change in the air- not just with the team, but with all the new facilities and upgrades going on- I asked Nick how long he'd keep coaching. Well, if you were Nick Aliotti, and you were going to have a season that made you say the hell with it, this was probably it. The defense played pretty well, even against Stanford, but his Washington State comments probably didn't go over so well, and that Arizona game was a disaster. I mean, if you were 38 years into a career relying on 19 year olds to keep your job and that happened, you'd probably realize that you have somewhere else to be as well. But I tell you, every time as a reporter I talked to Nick Aliotti, I got TV gold. That quote above was actually one of the more mundane things I ever got him saying on camera. He told you what he was thinking and that stood out above any coaching things he ever did. He acted more like a fan than any Oregon coach I've been around. He called Oregon State “little brother.” After a tense game once he asked for beer. I still remember when some guys got suspended from the team (for what I don't remember) and Chip and Helfrich (who was still the offensive coordinator at the time) were a bit reticent in their media appearances. Well, Aliotti came out and said exactly what we wanted to hear. It wasn't anything earth-shattering, but it was what somebody needed to say: that it was a dumb decision, that kids can't be doing whatever it was they did, that they need to learn from their mistakes if they want to be back on the team, and that he's going to do his best to make sure it doesn't happen again. And Aliotti got quoted in every media outlet saying that, because he was the one who spoke out. Now, he really can. Save travels, Coach Aliotti. Of course he's not the only coach in his final game on Monday. Mack Brown will be done at Texas after this as well, after he resigned/got pushed out/avoided being fired/decided he was done with it. I find it funny that Oregon's pushing the whole “the Alamo Bowl is a sellout, see we do travel well” argument. When the fact that San Antonio is 90 miles away from Burnt Orange HQ in Austin and there's probably a pretty big contingent of Texas fans wanting to see Mack on the sidelines one more time. 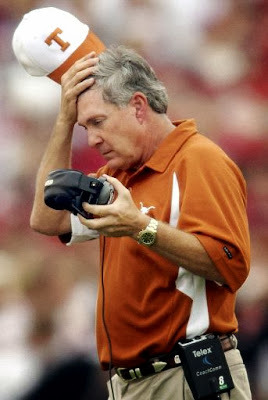 The more I think about it, the more Mack Brown and Nick Aliotti's paths in their final season has been similar. Both long-standing, respected coaches who probably just got tired of the grind. They have other things to do. They see all the health issues popping up with coaches who are younger than they are. Most likely, they heard the complaints, the same complaints they've heard for years, and finally pulled a Danny Glover in Lethal Weapon. Brown will coach again, and soon, but likely at a smaller school. Aliotti? He could come back. Never say never. I imagine he takes at least a year off, though. Anyway, because San Antonio is so close to Austin and this is Texas' second straight appearance in the game, (having beaten Oregon State last year) this is pretty close to qualifying as a non-bowl game as far as MSC's are concerned. But when you look at Alamo Bowl records and see that the four previous top attendance marks at this game involved a team from Texas (the Longhorns and Aggies), and two of those games are in the top five of Alamodome crowds, period, well, it makes sense, doesn't it? The bowl delivers what it promises. It's usually wildly entertaining. Remember RGIII when he was good, and the highest scoring bowl game in history? As for the game itself, well, I'm picking Oregon but I have a few things to watch for. One, the Oregon players were complaining about the possibility of going back to the Rose Bowl (because they'd “been there, done that,”) even before they got mashed by Arizona. Then they looked out of sorts even as they had a tremendous finish against Oregon State in the Civil War. So how are they coming into this game? If the Rose Bowl would have been a letdown, what's getting passed over for the Sugar Bowl by an unworthy Oklahoma team do to your motivation going to San Antonio? Then you've got the Texas factor. I bet it's 70-30 Longhorn fans vs Oregon fans. Oregon State should have beaten the Longhorns last year but I think the Texas factor made a difference. Oregon has shown that they struggle on the road against good teams- Stanford and Arizona being the example- and the Ducks are the a road team against a good team. Texas isn't even close to as good as Stanford, but are they better than Arizona? They might be. So here's where we find out what kind of team Oregon is in the Mark Helfrich era. I want to know if the Arizona game was a speed bump or an indication of what to expect. We will find out Monday. And then, we'll find out who they get to replace Nick Aliotti. Well, replace isn't the right word. I'm reminded of what Thomas Jefferson said when he arrived in Paris as the American Ambassador, taking over for Ben Franklin, who charmed the French to no end. To the next man up after Nick Aliotti, you'd be wise to remember that.